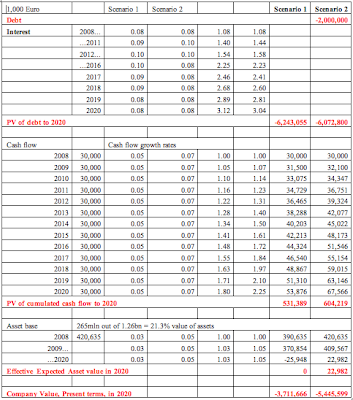 The balance sheet below illustrates clearly that even assuming 7% annual cash flow growth, plus 5% asset growth per annum for 2008-2020, a very benign interest rate environment (note we assume max cycle interest rate of 10% on Mr Carroll's borrowings in Scenario 2) and disposal of all his properties in the end of the term, the net market value of Mr Carroll's companies in 2020 will be a negative Euro5.7-7.5bn. Now, it is the only attempt of estimate Mr Carroll's loans net worth at this stage known to me, so do take your time to read through it. The really, really scary part, that if NAMA were to buy his loans at a 50% discount, NAMA will be making a cumulative loss of between Euro2.41-2.56bn by 2020. If the discount were to 70%, NAMA resulting losses will be Euro1.19-1.34bn. At a 70% discount, folks! And DofF still thinks we shall all p***s off: NAMA is here and there is nothing we can do about it! the Irish democracy, for DofF has expressed absolute and public disdain for the highest court of this land. Excellent! But will the greater population understand? We are talking about the most massive transfer to banking ever. Why? Is there any sane reason? What is the kickback? (3) NAMA is therefore inevitable. This represents both a logical /economic reasoning fallacy and a careless trust our media places in the state power / benevolence. Just read Brendan Keenan on NAMA. * settle this economy into decades of slow growth. The upside - to the Government - is that they bought more time to sit back and hope for the disaster to somehow miraculously go away. There is no other upside - full stop. The cost will rapidly become apparent and those responsible will be reminded every election for the next 30 years! There is a chance that the corruption in our public service, including politicians, will sicken enough people to demand proper investigation and punishment. My take is that since the DIRT debacle, the banks have had the political parties over a barrel. They know where the money has gone. Literally. They used secret accounts within the branch manager's account to keep deposits off the books. A bank within a bank. Hence the difficulty in supplying records to Tribunals .... the records have to be "extracted". Liquidate the developer so that their assets are no longer toxic and contractors can get back to work. If that means we lose five or six banks well, it is easy to issue a licence! The expertize for genuine productive lending can still be got together to make maybe one good bank. Then we can get a land tax organized. Forcing land sales willalso pick up revenues a little! Constantin, with respect, I think I must be missing something or misreading this. Where did the department tell the SC to "pack off"? I heard Brian Lucey making similar comments on the radio this morning (two fingers was his phrase). My read of the statement from DoF was a simple statement of fact - the examinership or otherwise of Liam Carrolls group(s) of companies has no impact on the planned implementation of NAMA. That is fact. The media had been spinning that the court would "have to" find for Carroll because otherwise it would be catastrophic and would collapse NAMA and the DoF simply issued a statement saying that it wouldn't/didn't. Another point on your analysis - you would presumably accept that you've made up all your numbers? Albeit a result of working in a vacuum in terms of actual valuations but it might be useful to more clearly spell out that you are making up the numbers. I also don't think that the commercial court comments re bordering on fanciful related to LC's company accounts as you infer - the judge was referring to the proposal being put forward that they could somehow jump from massive loss to profit in 3 years without actually showing any backup for how that would happen. Final point - you are presumably aware that Nama will take both performing and non-performing debt. Basing all of your analysis on the worst elements of the non performing debt (and I know there is loads of it) is disingenuous. Adrem, you are missing something. The Supreme Ct judgement crystallizes the loss in value of Carroll's property empire - thus making explicit the lies about the losses implied in the establishment of NAMA (leaving aside 'long-term value' a 'made up' number if ever there was one). The entire NAMA enterprise is really two fingers up to the nation. Now the fact is that the Supreme Ct. judgement shines a light on these two fingers. Your argument that the DoF is not sticking two fingers up to the nation by its announcement is true only in the sense that the two fingers are ALREADY stuck up in the air...Dr. G. has arrived at estimates based on all information. The numbers that are being made up are those by the DoF about the long-term value of the property. The fact that NAMA will take performing debt is nothing more than a smokescreen. The two-fingers comment is based on the fact that if the government were possessed of even small quantities of reason it would see the High Court and Supreme Court judgements for what they are. Decisions about the viability of the very thing they claim (with the biggest made up numbers in Irish history) has value when it doesn't and that they would act accordingly. Accusing Dr. G of 'making up' the numbers on this is like accusing a farmer of using 'excessive force' in squashing two locusts out of a swarm of millions that are eating his crop. Adrem, thanks for the comment. 1) On Supreme Court and DofF: Supreme Court ruling in effect says that development loans that Carroll has, given his company structure and rescue plan (that was optimistic by anyone imagination) are not sustainable as an ongoing concern under a restructure. In effect, they are not feasible as an ongoing concern under any reasonably model of restructuring. This ruling, apart from other issues it has for NAMA, simply tells us that the Court would not accept a valuation of Carroll's business as a viable enterprise under a discount that is currently being applied by the business valuation model that Carroll supplied (i.e reliant on existent debt of Euro156mln to ACC Bank against a total cash flow of roughly €30mln pa). This in effect blows NAMA idea of a discount in the regions of 20--40% out of the water for everyone in the country to see. 2) My valuation model of Carroll's concern is based on 'made up' numbers, but on clearly identified assumptions. If you want to challenge these - please do and I will be happy to recompute the model. As they stand, they are assumptions. What is not an assumption is the debt level currently carried (Euro2bn), the current cash flow from businesses (Euro30mln pa)and the implicit asset base value implied by the Supreme Court decision: 21.3 cents on each 1 Euro of the loans. What you can, therefore, challenge above are my assumptions: (a) Interest on the loans in 2 scenarios - note these range between 8% and 10% - the current junk bond corporate rates are in double digits, so these are rather underestimates, but feel free to suggest a better range of numbers; (b) Cash flow growth rate of 5% or 7% pa, again feel free to challenge these, but by banks current numbers, performing loans return around 6% pa - and these account for roughly 70% of the book, so effective across the book rates should be around 4.2% - again, my assumptions err on conservative side; and (c) asset base growing at 3% or 5% pa (again, these can be challenged, assuming you would wish to argue that development project and speculative land will post higher annual rates over the 2008-2020 period). So do send me any suggested changes to the balance sheet and I will gladly run them. 3) Final point - I am aware that NAMA is aiming to take on good loans as well. I am sorry to say it, but I do not understand this point. If they are 'good' loans, why would the banks sell them at a discount? If they are not selling them at a discount, but at a fair value, where is the upside? What is the opportunity cost of Irish Exchequer borrowing cash and investing it in this class of assets? Will we better off investing this cash in AIG shares? GM shares? GE shares? Thanks for commenting and comment again! DoF came out within half an hour of the SC saying "no hope of medium term growth" saying "well ,we think there is, so there". If thats not two fingers or pack off from them to the highest court in the land , i dont know what is. short of Doyle nutting the CJ this is a clear constitutional standoff. Do you favour NaMa? If so, why? Please in your answer explain why liquidation of bad loans is a bad idea for developers but a good diea for their customers and citizen mortgage holders? The scary thing is that Carroll is only one small cog in the overall scheme of NAMA. I'm starting to think that the Left have the right idea. If we're going to engage in Kamikaze-style economics, why not let the government buy every toxic debt in the country. It's only slightly less ridiculous than what's currently proposed, but infinitely fairer! Em, the your figure for the assets of €265M is actually the deficit not the assets. I would also note that the Court in no way supported the valuations in fact they took leave with the lack of supporting evidence. The excess liabilities over assets on an immediate wind up were estimated in the High Court (and this wasn't challenged by the learned judge or his learned colleagues in the SC) as 1bn. This excludes non group assets (ie personal assets of the directors which may or may not have been given as collateral against the loans. The 1bn valuation is based upon firesale valuations of all assets being sold now. The whole concept of NAMA is that in many cases assets will be worth more over a period of 10 years from now than they are now. It is a reasonable assumption when it comes to property assets particularly when you take into account the current environment and the demographic and economic factors which should over time allow for pick up in demand. The proposition outlined in some commentary that the decision of the court means immediate firesale of assets is of course flawed in itself. The court did not make such a judgement. They simply cleared the way for receivers to be appointed to the group. As you know a receivers job is to maximise the return for the creditors. The creditors in this case are the banks. Whilst the receiver(s) are likely to identify some asset sales (eg to deal with ACC if no other mechanism can be found) they are extremely unlikely to try and sell everything into a depressed market as this would minimise creditor returns thus negating the purpose of the receiver. Do I like NAMA - no of course I don't like it (and am fuming that the banks and regulator let us get into this mess) but I don't think there is much in the line of realistic alternative. AMA's of some shape or form have been used in resolving these types of property crashes internationally (yes this isn't the first such crash and won't be the last). Of course we could stand back and allow all the banks to fail or pick one to save but realistically would that work or would that simply serve to make us feel a bit better ! Finally - the FT recently changed its tune on the prospects for an Irish recovery. A significant number of people would have been referring to the FT view when it was very negative but seem silent on their change of position. Interestingly the only significant criticism of NAMA outlined by the FT was the fact that it has a clause to protect the State if the initial transfer valuations are wrong - if that happens the participating banks will be levied to make up any shortfall. This is a protection that ensures that over the long term NAMA will not cost the taxpayers - and yes that might be 20 years from now but lets not forget all the hysterical commentary that NAMA will saddle our grandchildren with billions on debt !! NAMA will presumably be a corporate body. That does not mean it has to be a Company, although that is what everyone assumes it will be. I set out a way in which property could be financed - and in the case of NAMA, refinanced - with a new form of equity in an "Open Corporate" legal framework incorporating partnership principles. In essence banks would receive income bearing Units of NAMA Equity instead of debt, and would be free to sell these at any time to investors prepared to buy them. This bypasses the valuation problem, since there need be no sale. Moreover, it means that Banks receive a much better outcome than any solution which leaves a debt obligation intact. The necessary funds would come from long term investors interested in a long-term, probably index-linked, property based (and interestingly enough, Sharia'h compliant) investment. Both Willem Buiter and Nicholas Taleb have been pinting out that no debt-based solution is possible tothe Credit Crunch. I simply propose a new approach to Equity. This can be, and IMHO should be, a core policy of Ireland's Green Party. James Pike has fleshed out my thinking tactically, but has unfortunately missed the strategic opportunity. Looks like the grassroots members of the Green Party are demanding a special convention be held. Apparently the grass roots are unhappy about NAMA. this could force the Green TDs to vote against NAMA. The next few weeks will be very interesting. Looks like FF latest attempt to protect its cronies could lead to the downfall of tis government I feel an election coming on. The Carroll case and NAMA are key discussion points. Yes, it is true that NAMA would be able to get a 'better outcome' than Carroll's companies and the wider group can on their own. NAMA is a state-ran asset company that does NOT have to be transparent, abide by normal company rules, plus it can also be a de facto "opoloy" on the property market, thereby exerting upward prices due to property control. I know other countries riot if their govenment becomes a police state, but NAMA will be state intervention at a level which is above that of Mugabe! Another factor is that our ill banks which are state guaranteed, which are in hock to the likes of Carrol's failed risks, etc, and have been giving his companies plus others an unfair lifeline. They have done al that they can to prevent Carroll from going under yet extract profits from their businesses elsewhere. Its blindingly obvious inequal. The state is hoping that the people will pay for NAMA drip by drip over the forthcoiming decades and are still plying the mantra that 'we were all in it'. Its up to the people if they want to have NAMA or not. For me, NAMA is a biiiigggg mistake. It cannot make sense to 'steal' economically from one cohort for the benefit of a minority other. Even Saddam wasnt as blatant! Increased costs and unfairness for us and our children may be a financial "chemical weapon" in another guise, whilst it may be masked by the sweet smelling talk of legislation, etc. No state has ever made a decision like this. There is quite a bit of anger on this site and inded you express it too Constantin. Whlst anger is an emotion that most people will go through once they realise what is happening with the proposed NAMA, people need to keep focussed on changing what may seem now as inevitable. Anger if directed into a movement could be useful but ranting and leaving it will only just act as a relase vent and nothing more. Constantin are you not moderating anymore?? Come on - lets keep the debate rational here. 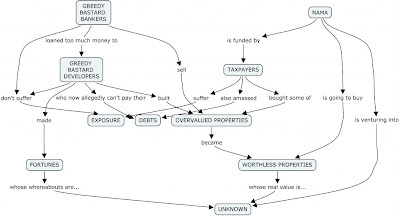 Cojock - can you explain how your open corporate framework obviates the need for valuation? If you are giving the banks income bearing units how do you determine what to give them? Are the units not linked to the land pool? If they are do you not have to transfer that land pool from the banks to the central custodian and in order to do that do you not need to apportion a value to them? I have to say overall I still don't get the anti-NAMA argument at all (maybe I'm just a bit thick!). As I see it NAMA allows us to force the banks to write down some of the value of the bad debts, transfer the rest over to NAMA along with the supporting land assets. Nama will spend the next ten years trying to make more money from these assets than they paid for them and if we don't then will go back to the banks and take the difference back in the form of a levy. If NAMA works the tax payer makes a profit (albeit way off in the future) and if it doesn't the banks have to make good the loss. The banks shareholders take a bath (down 90% ish) on this but post Nama should be able to get back to business and start turning a profit. The state will be a large shareholder in the banks post Nama (possibly a majority shareholder in some cases) and will benefit from that share price movement. ie the banks returning to profits not only helps the broader economy in terms of their improved ability to supply credit but also in nominal terms as we will own a big chunk of the shares. Constantin (and others) your argument against isn't coherent - it seems to be predicated on inbuilt prejudices and assumptions(which may be valid but shouldn't form part of a discussion like this). It may well be the case (and I'm not saying it is or isn't) that the relationship between the developers, valuers, bankers and politicians makes it difficult to see how NAMA can handle the valuation and asset-debt transfer at the appropriate level but surely that argument is predicated on an assumption that we can't possibly take as true? If the valuations are done properly what is the flaw in NAMA? It's quite simple. The banks exchange their financial claims over income (which may be notional) bearing assets which consist of secured debt, for a different financial claim. This new quasi equity claim consists of a proportional share (eg billionth) in the "Rental Pool" of land, which may or may not be developed, and may or may not have occupiers/tenants. (b) the capital already invested in the location. There is no valuation necessary. Clearly a land/location rental value will be part of the equation, as will a rental value for the capital invested in the land. Bear in mind that in Hong Kong, some 35% of tax income comes from a land rental (most of Hong Kong was never freehold). if anyone in Ireland is seriously interested in a viable solution,and is prepared to engage reliably. > Constantin are you not moderating anymore?? > Policy state? Mugabe? Saddam? I just used these as example of state intervention. NAMA is a state intervention which on the face of whats described so far will PURPOSELY pay more for something than the market is willing to pay for itself. The future bank levy can only be paid for by the banks from their operational profits so will be moving money from yet more taxpayers. It is stated as an aim of NAMA as a means to save our banking system, and will as a result attempt to artificially suport property prices thus as a consequence giving money to developers (especially those not in NAMA). Imagine if the Dutch Givernment back after the tulip bubble bought up tulips above the market rate and became a tulip supplier with the aim of bailing out other tulip suppliers and dealers and tulip lenders, etc. It would have been madness then. NAMA is madness now, except that its politicians playing not with their money but with our money. I know how much money I could spend in a casino if it wasnt mine. I guess you know how much you could too. And people that trot out that NAMA is the only game in town, that our banks must be saved etc, now that certainly is an ideology that seems misdirected at best. Economics 16/08/2009: A tax too far? Economics 09/08/2009: Calling a turning point?